Thinking of making the move from Blogger to self-hosted WordPress? I don’t blame you. With over 25% of the web now being powered by WordPress, it’s clear that the blogging battle is over. WordPress is the winner. But don’t worry, even if you’re currently using Blogger, it’s easy to transfer things over to a new self-hosted WordPress site. There’s a lot more to migration than just content, though. You’ll also want to keep your Google rankings and links the same. If you follow our guide, you can do just that. You won’t have any broken links and Google will never notice that anything changed. In this post, I’ll go through and give you the exact step-by-step guide you’ll need to move your current Blogger site over to a brand new self-hosted WordPress install, without losing any of your Google rankings. If you’re moving to self-hosted WordPress, you’re going to need a good host. Blogger won’t be there to host things anymore. We’ve put together a full list of the best WordPress hosts, but our overall recommendation for a new WordPress user is Bluehost. They offer affordable WordPress packages that make it easy to get started and configure everything. They’re also an official WordPress.org recommended host and get overall great reviews from their customers. Many other WordPress hosting providers operate similarly. Just find the specific installation instructions for your host. 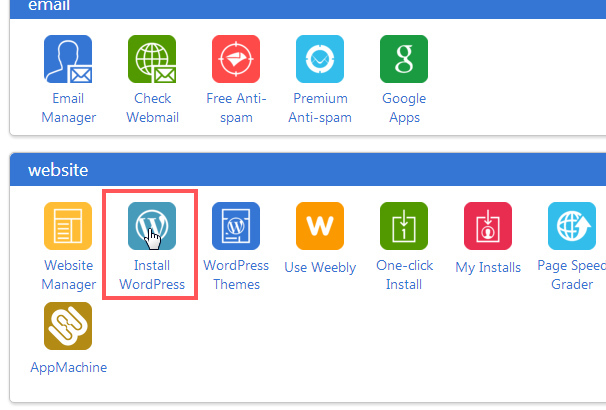 Once you’ve got WordPress installed, you can continue on to the specific steps to transfer your Blogger site over. Click Save to your computer to save the .xml file. In the next step, you’ll need to upload this same file to WordPress to import all your Blogger posts, so make sure to remember where you saved it. 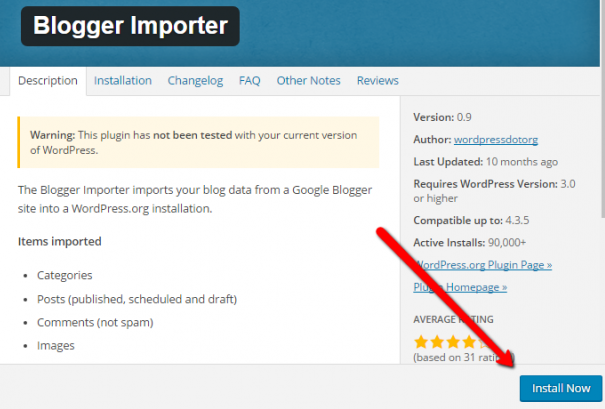 WordPress has a dedicated Blogger import plugin that makes importing the .xml file and all your Blogger content super easy. 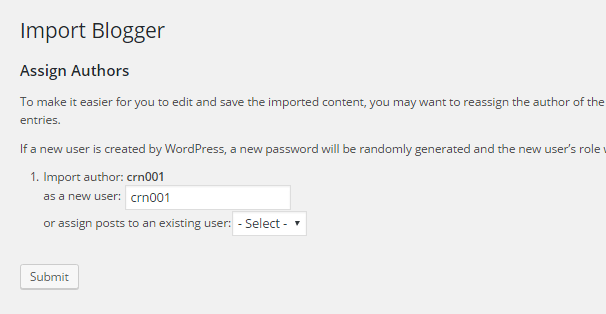 WordPress will let you assign an author to all the posts you’re importing. If you’re the only author, just select yourself. If you want to give the posts a different author name, you can select a different account. You can always create a new author account for all the imported posts if you want. 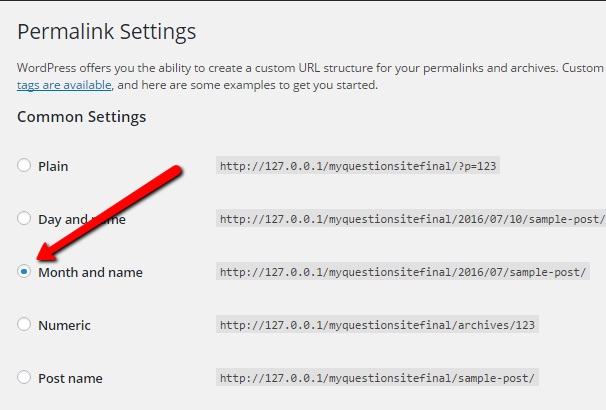 WordPress makes it easy to choose how your permalinks look. Permalinks are essentially the unique URL for each post or page. They’re very important. 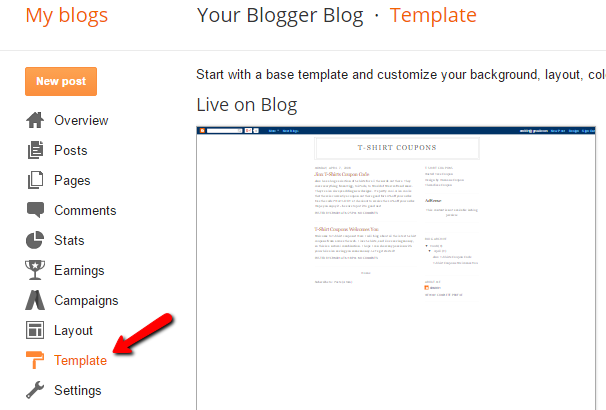 To try to mimic how Blogger structures URLs, select the Month and name option. It’s essential that you pick this option so that the redirect code you add in the next few steps will properly work. If you want a different URL structure, you’ll have to find slightly different code to match. So now you’ve imported your posts and set yourWordPress permalinks, but you still need to redirect anyone who goes to one of your Blogger URLs to the right post on your new WordPress site. You want people and search engines to be able to easily access the same posts so you don’t lose any of your traffic. 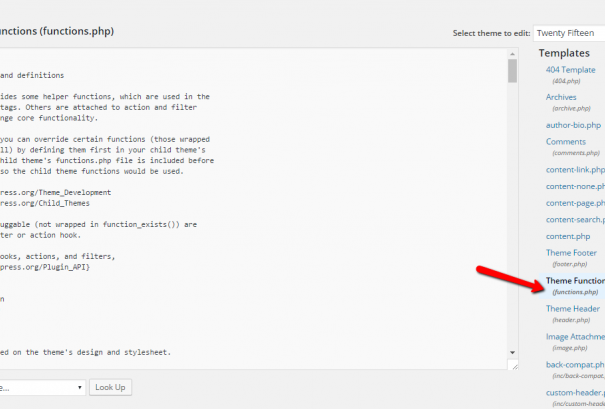 To do that, you’ll need to add some code to both your Blogger site and your WordPress site. Let’s start with your Blogger site. Select the Revert to classic template so you’ll be able to easily add some redirect code. After you’ve added the code, click save. 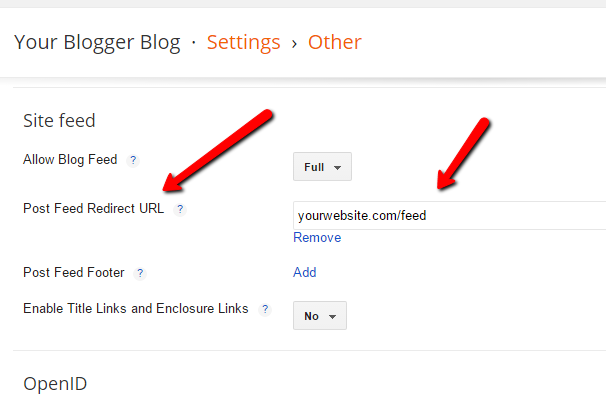 Your Blogger site will now redirect to WordPress, but you need to do one more thing to get redirects fully functioning. You still need to set up some redirection on WordPress to be able to properly handle the Blogger redirects. 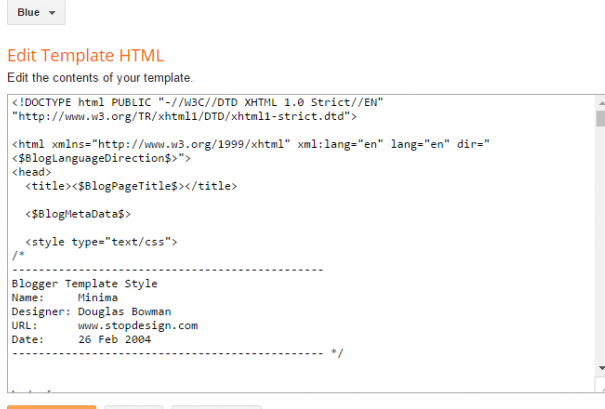 This code will set up a 301 redirect, which is the most SEO friendly type of redirect. It will ensure that Google knows your posts have permanently moved and they should give the same weight to the new post as the old post had. Both humans and search engines will now be permanently redirected to the new URL structure on your WordPess site. In the box, enter the URL for your new WordPress site’s feed. This is usually something like yourdomain.com/feed. 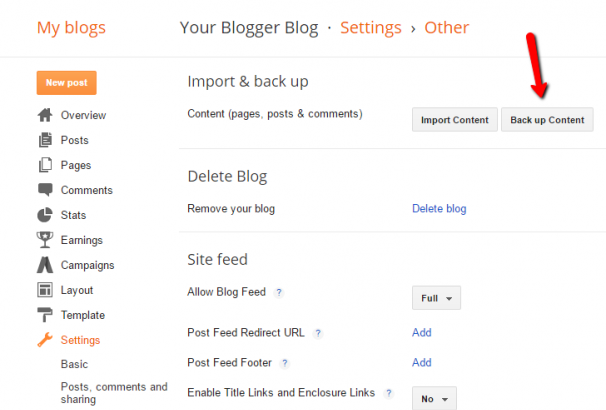 Now, anyone who has your old Blogger RSS feed will be redirected to the new, correct RSS feed. Once you’ve set up all the redirects, you should be done with transferring your Blogger blog to WordPress. Importing your posts should automatically include all the images, but if any got missed in the process, you can manually import them into your media library to ensure posts look the same. Make sure to double check everything. 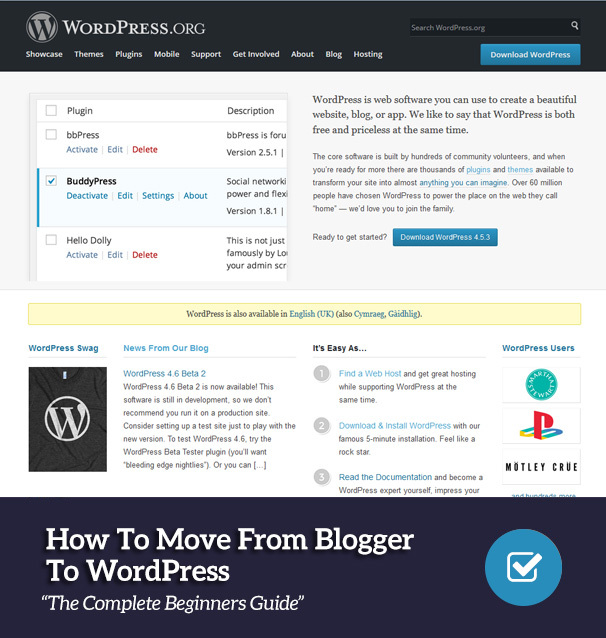 I hope you enjoyed our guide to moving from Blogger to WordPress. It’s not difficult, and I’m sure you’ll enjoy the much-improved functionality of WordPress. Just remember, you’ll need to pick a new theme for your site as a result of the switch. Why not check out our themes? We currently offer our complete collection of themes from just $49. Other than that shift in appearance, all the basic functionality should be the same. You’ll have all your old posts and the URLs and RSS feeds will be redirected. I hope you enjoy your new WordPress site! Hi, I’m having trouble following your tutorial. In step 3 you say to choose your permalink structure. But there isn’t an option in wordpress under settings for permalinks. Did that get moved somewhere else? Everything was going great, and then I got to step 5 and now that code is visible above my header on the homepage. When I go back to funtions.php it isn’t in the code listed so I’m not sure how to delete it! Can anyone help? I do not know if it’s just me or if prhaps eeverybody else encountering problems with ylur website. browser becauwe I’ve had this happen previously. I’ve read your blog it is very useful for me. I want to say thanks to you. I have bookmark your site for future updates. Nice Post! 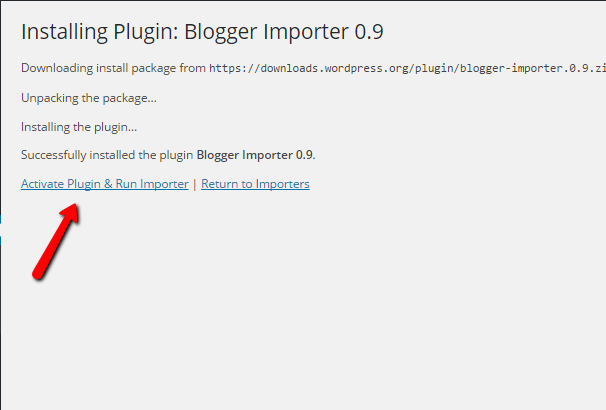 I think After downloading the export file from Blogger, the next step is to import the file into your new WordPress site. 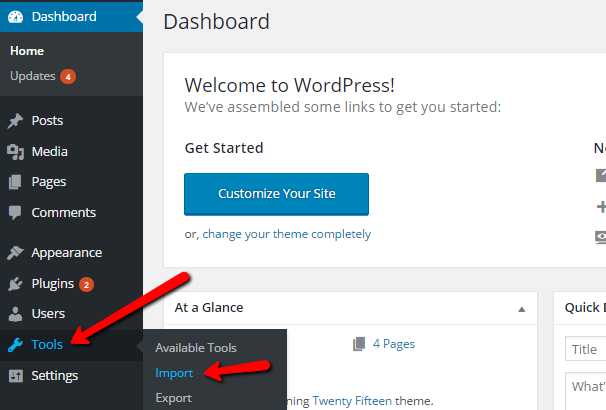 Log into your WordPress dashboard, go to Tools » Import. 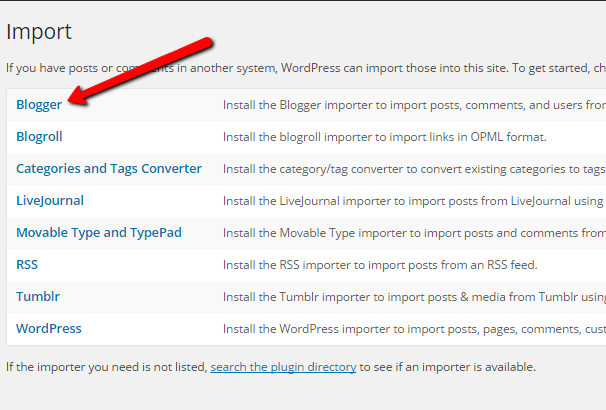 Just below the Blogger option, click Install Now. Then, click Run Importer.